The UCL Centre for the History of Medicine (formerly the Wellcome Trust Centre for the History of Medicine) is an academic research and teaching centre for the history of medicine located in London, United Kingdom and a part of University College London (UCL). 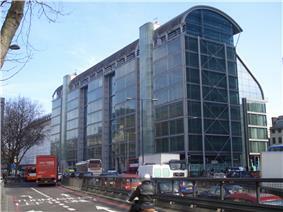 The Centre was founded in 1966 and received its primary funding from the Wellcome Trust until 2012. As of September 2012, it had four emeritus academic staff, six teaching staff, and associated staff in a number of other UCL departments. The Centre is based in the UCL Medical Sciences Building in the main UCL campus on Gower Street in the Bloomsbury area of Central London, close to the British Library and University College Hospital. ^ a b c d e f "Highlights 2010". UCL Centre for the History of Medicine. Retrieved 28 May 2011. ^ a b "People". UCL Centre for the History of Medicine. Retrieved 27 September 2012. ^ a b "Terminal diagnosis for UCL’s history of medicine centre". Times Higher Education. 20 April 2010. Retrieved 2 November 2010. ^ "A historical postmortem". Times Higher Education. 11 May 2001. Retrieved 2 November 2010. ^ a b "The Wellcome Trust Centre for the History of Medicine must be saved from closure". The Telegraph. 17 May 2010. Retrieved 2 November 2010. ^ "Double jeopardy: UCL and charity's clashes contributed to centre's fall". Times Higher Education. 29 April 2010. Retrieved 2 November 2010. ^ a b "The new UCL Centre for the History of Medicine - Director's Announcement". UCL Centre for the History of Medicine. Retrieved 28 May 2011. ^ "Publications". UCL Centre for the History of Medicine. Retrieved 28 May 2011. Medical History, a refereed research journal, available as an open access journal. On 15 March 2011 it was announced that the Centre would be relaunched as the UCL Centre for the History of Medicine for the 2011/2012 academic year. It was announced that the Centre would move from the Wellcome Building on Euston Road to UCL's Medical Sciences Building on Gower Street and that its research focus would now be the history of neurosciences and related fields. In April 2010 it was announced that the Wellcome Trust would not be renewing its grant for the Centre, and that it would therefore be closing within two years.